Every prime number generates a new musical universe. Prime numbers are numbers, greater than one, that can only be evenly divided by themselves and 1. All other numbers are composite — that is, they can be made by multiplying two or more primes. 1) Multiplying by 1 does nothing. 1 is a singularity, the universe before the big bang, the anvil upon which the music is forged. 2) Two starts off the explosion. Multiplying by two creates a universe of octaves, an endless, sterile line of equally spaced mile markers on the road to harmony. Reminds me of the first chapter of Genesis, where everything is formless until the Creator starts differentiating stuff, day from night, water from sky, land from water, animals from plants, and people from animals. Start multiplying by two and before you know it you have a universe! I’m also reminded of the current theory as to how our own universe came to be. Here’s a nice summary I found on a physics message board. It’s by Joel Novicio, an undergraduate physics student at the time. The Big Bang singularity is a point of zero volume, but very high mass, which makes the density infinite. This singularity contained all of the matter and energy in the Universe. The initial moment of the cyclopean explosion very well remains a mystery — however, astronomers and physicists believe that after the tiniest fraction of a second, the strong nuclear force and the electromagnetic force separated, which probably caused the Universe to begin inflating. The Big Bang itself created space, time, and all of the matter and energy we know today. OK, maybe I’m getting a little bit woo-woo here, but really I don’t think this is a trivial or accidental connection. The musical universe arises from the numbers. So does the physical one, at its deepest levels. I think that’s why we perceive music as beautiful. I am stretching it now, but guess what is thought to have happened next after the splitting of the forces? 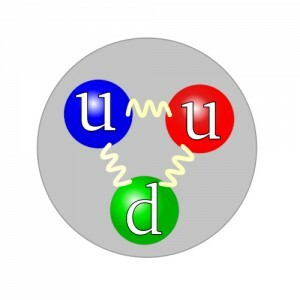 Quarks! Quarks are the building blocks of protons and neutrons, almost all the matter we’re familiar with. And they come in threes. 3) Three makes it interesting. Keep multiplying and dividing by 3 and you can get an equivalent for every key on the keyboard, and many more. The notes never repeat, as you multiply and divide, so this universe is infinite as well. This is the central spine of the lattice. The crucial notes 4 (perfect fourth, 4/3) and 5 (perfect fifth, 3/2) are multiples of 3. They are the backbone of music, and in my opinion, the fact that these are almost exactly in tune in equal temperament is a big reason why ET has been able to be so successful. If the 4 and the 5 were as far out of tune as the major third is, I don’t think ET could ever have been adopted. Pythagoras based his musical scale entirely on 3 and 2. His followers expanded this, compounding it many times into what is now called Pythagorean tuning. The first few notes generated by this tuning are beautiful. The 5 (x3) and 4 (÷3) are perfect consonances. The 2 (3×3) is really sweet. I personally like the Pythagorean sixth (3x3x3, 6+ on my map). But apparently the ear can’t follow compounds of 3 forever. By the time you get to the Pythagorean major third (3x3x3x3) you have a dissonant note. It’s on the central spine of the lattice, just off the border of my map, to the east of the 6+. Here’s a 5/4 major third, with the tonic, and then in the context of a major chord. Now here it is in Pythagorean tuning. It’s even sharper than the equal tempered version. Ouch! The universe of threes is infinite, but still somewhat limited musically. 4) Four doesn’t add anything new, it’s just two octaves, every second mile marker. 5) Five, on the other hand, combines with three to create a vast and wondrous universe, the world of the lattice, and adds many more flavors of consonance, dissonance and beauty. The twelve tones I’ve just described, and virtually all of European classical music, can be found in this universe. 6) Six, like four, adds nothing fundamental. It’s 3×2, and generates only Pythagorean intervals. America doesn’t export much any more. Except culture. American music, and the movies, have spread worldwide. Strange turn of events considering that 100 years ago, America was pretty raw. It imported much of its culture from Europe. But when it imported the music of Africa, and combined it with the music of Europe, blues and jazz and rock and roll were born, and the world’s music is still ringing like a bell. Go Johnny go! In my opinion, the great advance in this music (harmonically, at least), is the incorporation of the prime number seven.